We spent 7 days researching and testing 10 different types of exercise resistance bands and found that stackable resistance in pounds, number of pieces, and quality of the product were most important. 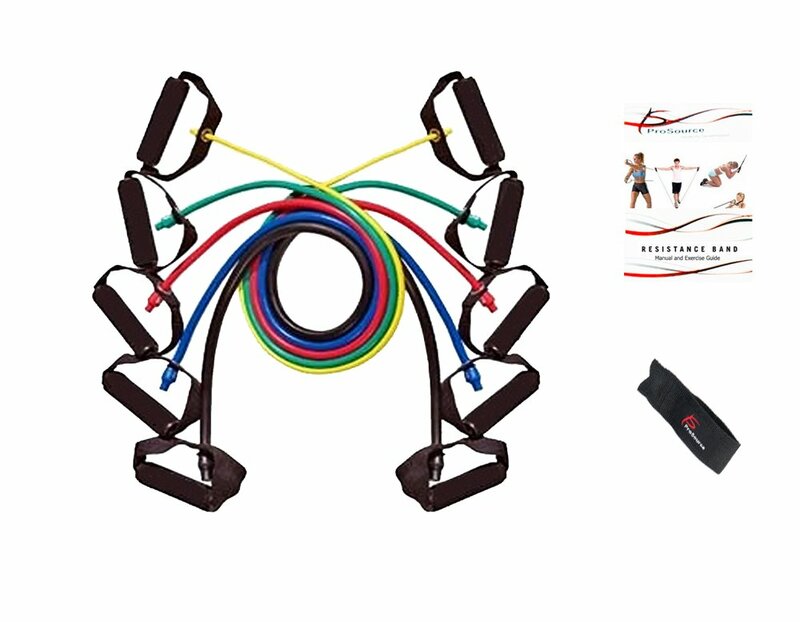 Bodylastics Max Tension exercise resistance bands scored high marks in every category and are our top pick. This set contains 12 pieces that offers weights from 3 pounds to 96 pounds. A lot came in this set including 5 bands, two heavy duty handles, one door anchor, two heavy duty ankle straps, a bag to carry it all in and an instructional resource as well that shows how to use the bands properly. Today it seems like everyone wants to work out and get in shape. As we become more aware that healthier living can extend our physical life as well as the quality of life, more and more people want to build exercise into their daily routine. The challenge is how? With our lives busier than ever it is harder to find time to get to the gym, not to mention the very high costs of gym memberships. Exercise Resistance Bands are an inexpensive solution. They provide a top quality workout and can accommodate any fitness level. Competitive athletes love resistance bands because they can be used anywhere, don’t take up much room and yet can provide between 50 and 100 pounds of resistance. They are flexible and offer a wide range of strength exercises. Average people love resistance bands because they are compact and inexpensive. They can be carried everywhere. Whether you are on a business trip and on the road, in your office or the comfort of your home. You can pull them out, workout for a few minutes and continue with your day. They provide fast results and accommodate any skill level. Women love resistance bands because they can be combined with favorites like Yoga and Pilates. They provide body toning and help with weight loss and can be carried in their purse. The stronger the muscles are the higher the metabolism. As we age a slow metabolism is our enemy. Resistance bands can increase muscle strength which results in a faster metabolism. The elderly love them because they help maintain muscle tone and strength. The bands can also be used during injury recover and can increase flexibility. Lower weights can be used with only 2 to 5 pounds worth of resistance, which makes them very flexible for aging seniors. Resistance bands can be used at every age and skill level. The band sets are becoming more and more popular as a great way to incorporate resistance training into the everyday workout. This has produced a large number of companies that sell exercise resistance bands. Unfortunately this means there is also a wide range in the quality of the bands. Many less expensive brands will lose their elasticity and will only be able to be used for a short time. The ends where the handles connect to the band are prone to break in lower quality bands. The handles are often not comfortable on low quality bands. Higher quality bands use stronger material, stronger connections for the handles. The handles are covered in a foam which makes them more comfortable and provide a stronger grip. With the high end bands still being very affordable we recommend you choose a top quality brand made by a top name company. This will provide you with a solid product that will perform as needed for years to come. If you are not comfortable you are much less likely to use the product. Our objective is to help you determine which features are most important for your purchase. Our buyer’s guide will help you understand the differences in the products and the features that will most likely be used in your everyday workout. TheBodylastics 15 pcs Max Tension Resistance Exercise Bands Set provides a professional quality workout at a very economical price. This exercise equipment is designed to produce maximum fitness results without bulky machines or the need to store heavy weights. When purchasing this professional set you will receive five anti snap bands. This includes a yellow three pound band, a green five pound band, a red eight pound band, a blue thirteen pound band, and a black nineteen pound band. 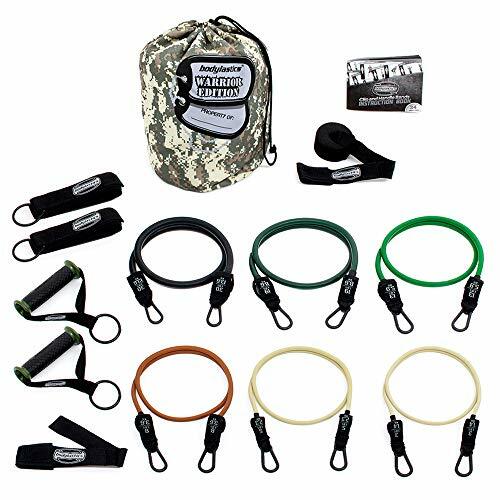 Also included are two heavy duty handles, two heavy duty ankle straps, one door anchor, a carrying bag, and one instructional resource.The instructional card illustrates a wide range of exercises that can be accomplished with the resistance bands. The Bodylastics workout offers weights from as low as 3 pounds of resistance to a maximum of 156 pounds of resistance, when bands are combined. This flexibility will meet the needs of all workout levels. Another great quality of the Bodylastics bands is the quality of the product. They are designed with the customer’s safety in mind. Each band is built with the patented anti-snap safety design, which means the bands have an anti-snap chord. The Snap Guard anti-snap chord is extremely durable and strong preventing damage to the chords due to over stretching. It also creates protection from your body and face should the exercise band ever snap. This feature will give you confidence during every workout, knowing you are safe even with heavy use. The Bodylastics clip bands enable you to both add and subtract resistance depending on your needs. These bands can withstand between three and ninety six pounds. Working just like the stackable plate machines found at the gym. This wide range of weight and pressure capacity makes the bands perfect for all ages and all fitness levels. The amount of resistance needed will grow as your workout grows,saving you from having to purchase new equipment. The various bands and weight restraints also make this perfect for toning all muscle groups. The Bodylastics Tension Resistance Exercise band set has incorporated the highest quality construction. The 15 piece set features materials such as, Malaysian natural latex, along with incredibly strong inner safety chords, woven nylon webbing, solid iron clips, and dense neoprene. Only the finest materials have been used to produce a professional grade workout that can also last you a lifetime. The company offers a 60 day 100% money back guarantee. If you do not love it, you can return it for any reason. The manufacturers are so confident that you will love this workout system that they also offer a lifetime guarantee on the Bodylastics 15 pcs Max Tension Resistance Exercise Bands Set. Customers love that this a complete set, providing a complete workout. The set can be used for all exercise levels so a father and young son can work out together with the same equipment. They also love the quality of the bands and that they last so long. Often less expensive brands will lose their stretch or will break. These top quality bands continue to work effectively even after heavy use. Customers love the versatility and the ability to add resistance as their work out improves. The Black Mountain Products Resistance Band Set has eight pieces. It provides 5 top quality bands for a complete workout system. 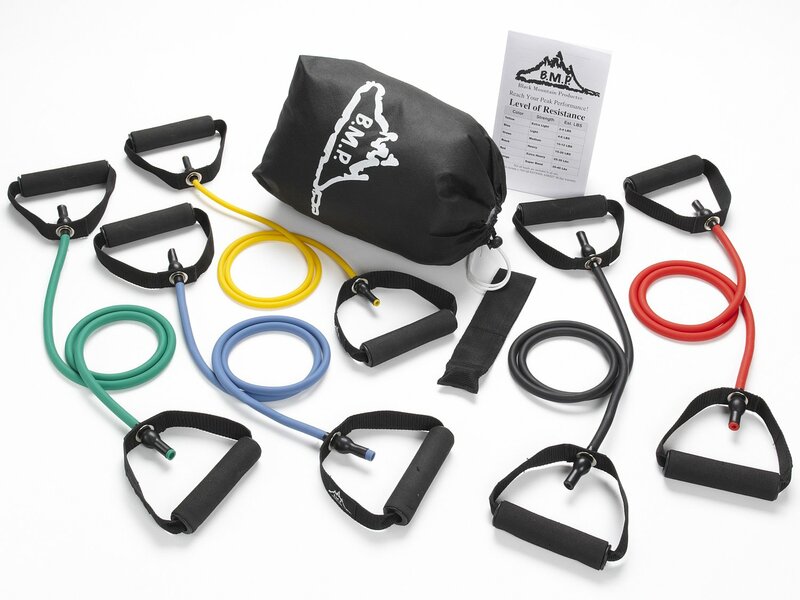 The black mountain resistance band set includes, a yellow band for two to four pounds of resistance, a blue band for four to six pounds of resistance, a green band for ten to twelve pound of resistance, a black band for fifteen to twenty pounds of resistance, and a red band for twenty five to thirty pounds of resistance. Is also includes a carrying bag, instructional guide, and a door anchor. This set is very flexible and provides the equipment needed for beginners to advanced level workouts. These can be used by those who are rehabilitating from an injury (get doctor’s approval first), to those needing to tone your body. If you want to lose weight or bulk up, this resistance band set has everything you need. The set offers weights as low as 2 pounds which can be used by children, injury recovery, or the elderly. The larger weights are up to 30 pounds of resistance and offers weights needed for more experienced users. Bands can also be combined to provide resistance up to 72 pounds. The bands with less resistance enable you to tone muscle groups without straining or adding too much pressure. This set is excellent for senior citizens who are interested in staying active in a safe and sound way. The higher weights are used by competitive athletes. All bands included in the kit are 48 inches in length, which is standard. They can produce up to 72 pounds of resistance when all the bands are combined. The handles have a soft foam grip providing a firm yet comfortable grip even when you are holding multiple handles. The door anchor allows you to use the band while standing using a door or wall for leverage. Each band has its own handle so you do not have to interchange the handles during a workout. This makes the transition between resistance levels simple and fast. The Black Mountain Products Resistance Band Set is constructed of top quality synthetic rubber. This provides the ability to stretch continually without losing its spring. The connection between the band and the handle will rotate giving you a comfortable workout. The manufacture offers a 60 day satisfaction guarantee and a lifetime warranty against the bands breaking. Customers love the quality of these bands and the fact that they are so portable. The set provides enough weight resistance for customers of all skill levels and ages. These bands provide an effective workout without taking up much space. They are light enough to carry with you during travels and strong enough for those in competitive sports to still benefit. The bands also stand up to heavy usage. The ProSource Premium Double Dipped Latex Resistance Bands are a great addition to any home workout routine. This 8 piece set comes with 5 bands. The yellow band provides 2 to 5 pounds of resistance, the green band 5 to 8 pounds, the red band 8 to 12 pounds, the blue band 12 to 16 pounds and the black band provides 16 to 20 pounds of resistance. Also included in the set is a carrying bag, a door anchor and an exercise instructional manual. With the lowest resistance of 2 pounds the bands can be used for beginners, the elderly, or those who are recovering from an injury. You can also combine the bands for a maximum resistance level of 61 pounds, for more advanced users. This will accommodate competitive athletes, beginners, and everyone in between. Age is no longer a limitation when it comes to physical fitness. These bands work exceptionally well, even for seniors who want to maintain or improve their physical abilities. 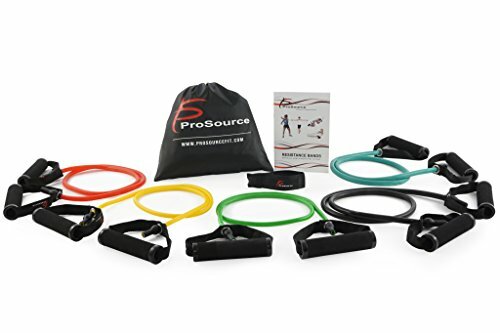 The ProSource premium resistance bands are constructed with a double dipped high quality latex rubber. They have a comfortable foam grip on the end of each band, eliminating the need to switch the grips from band to band. The foam grips you will find on every handle not only creates an extremely comfortable exercise experience but also works as a safety feature ensuring that your hands will not slip causing a potential accident. The handles are connected with a metal piece that rotates increasing its comfort and flexibility. The band ends are made of a high quality metal carabineers which keep the handles securely in place. The door anchor allows you to maximize your workout by providing the ability to attach the band to a door or wall, increasing the number of exercises you can complete. The carrying bag is included for added convenience and travel. It will also help you store all of the bands in one place which will prevent them from becoming lost or separated. No need for bulky machines or a trip to the gym. They can be used independently or with another work out program like yoga or Pilates. Each of the five resistance bands are forty eight inches long making it the perfect length for customers of all heights. Also the small and convenient size minimizes the amount of space you need to use them in your home, office or anywhere else. In addition to using the bands individually you are also able to combine the bands to meet higher resistance needs. TheProSource Premium Double Dipped Latex Resistance bands offer a 90 day warranty and will be replaced in the event of a defect in material or workmanship. Customers love the resistance bands and the ability to change their workout routine to fit their needs. They can be used by everyone in the family even though everyone has different workout goals and are at different levels. Customers appreciate the warranty, though with such high quality construction, few had needed to use it. The quality of the bands mean they can be used every day and will still last for many years. The featured resistance bands are all sets that are lightweight, top quality bands that can be used independently or combined with any existing workout routine. The bands are compact and can be used in your home or on the road, depending on your needs. Each set comes with an instructional book and 5 resistance bands. The Bodylastics bands have the highest combined weight of 96 pounds. With a workout weight range from 3 pounds to 96 pounds. The Black Mountain also comes with 5 bands and a weight range from 2 pounds to 72 pounds as a maximum weight. The ProSource offers a maximum weight of 61 pounds with a weight range of 2 to 62 pounds. The Bodylastics comes with one handle that is removable. You will place the handles on the ends of the bands you want to use before each set. While this does require changing the handles for each resistance level, it is easier to combine bands for heavier weights. Both the Black Mountain and the ProSource offer handles for each band. When combining these weights you would be holding multiple handles. All three brands offer an anchor for the door which extends the number of exercises that can be completed. The Bodylastics offers an additional attachment for your ankle which increases the convenience. Bodylastics bands are made of Malaysian latex rubber, the ProSource is made of double dipped latex rubber and the Black Mountain is made from synthetic rubber. All are well constructed and should last for many years even with active use. The Black Mountain and Bodylastics both come with a 60 day satisfaction guarantee and a lifetime warranty. The ProSource comes with a 90 day warranty. All warranties are on the bands and cover breakage or defects from the material or construction. Regardless of which set you choose you will be sure to enjoy these exercise bands for years to come. What is an Exercise Resistance Band? Exercise resistance bands are a long rope like product made of looped or flat rubber. The tubes are usually made from either rubber or latex and come in various lengths and widths. The variety provides different resistant levels to accommodate those of all ages and fitness levels. The resistance bands can provide a quality workout similar to those obtained with free weights or machines. They can provide cardio workouts, upper and lower body workouts as well as core training. Some users combine them with Pilates, yoga, stretching exercises, flexibility exercises or strength training. These exercises relieve stress on joints, strengthens and tones muscles. Everyone can benefit from resistance bands, from seniors, to those recovering from an injury, to professional athletes. Exercise bands can be used to replace free weights and machines, or they can be used in conjunction with an existing workout. The bands provide different resistant levels depending on their size. The different colors represent the size and resistance the band provides. Wider and thicker bands provide greater resistance. Having a couple different bands can provide a workout for arms, legs and stomach muscles. Since different muscle groups need different levels of resistance most users find a set is most beneficial. You can use the bands while standing or lying down, providing a wide range of exercises you can experiment with. Affordable Workout Option: Gym memberships can be both expensive and time consuming. 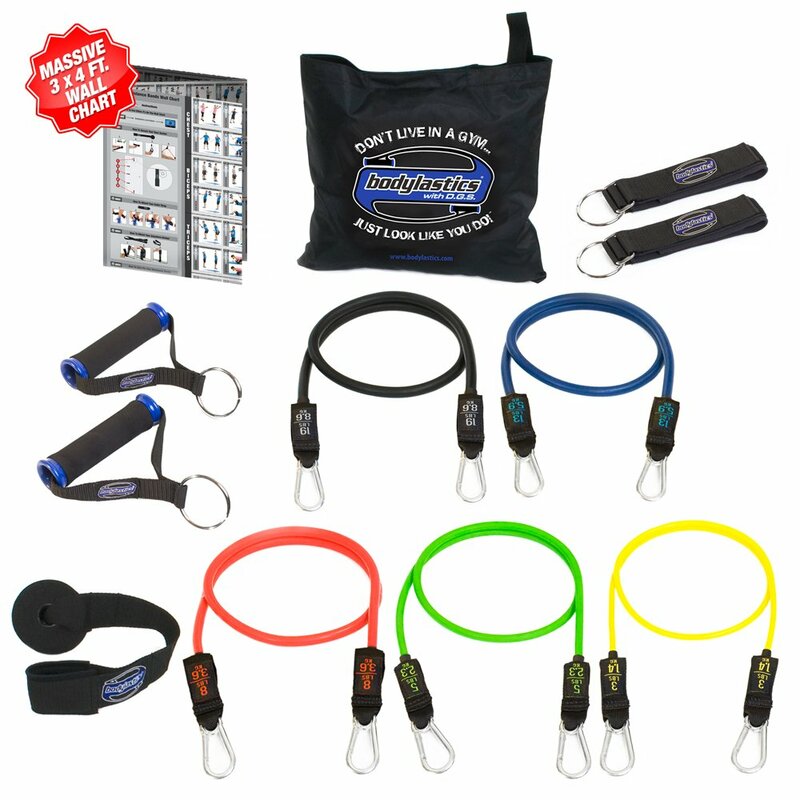 Resistance bands are a very affordable option and can cost just a few dollars for one band or under $40 for a top quality band. There is a big difference in the quality of the rubber and elasticity from the lower level bands to the higher quality options. With all options being very affordable, buying a set from a reputable company and made from higher quality materials will provide better quality bands that will not lose their elasticity at a very affordable price. Will Travel Anywhere: The bands are lightweight and small making them very portable. They will fit in your purse, travel bag or duffle with ease. They are lightweight meaning they can be brought along with you on trips ensuring you can get a workout wherever you are. Working professionals and those who travel really benefit for its high level of portability. Effective Workout: Ultimately you want a workout that is effective. Resistance bands can work all your muscle groups and you can adjust which band you use depending on the resistance level you are seeking. Bands provide enough resistance for both strength training and toning. It will help you lose weight by increasing the burning of fat and will also tone and strengthen muscles. High levels of resistance is provided by combining bands, which enable athletes to benefit from the exercise bands as well. Compact Design: Think of carrying a few jump ropes with you, because that is the approximate size and weight that resistance bands are. Some come with a carrying case which makes portability even easier. Versatile Workout Option: The ability to work out all muscle groups is one of the key benefits to using resistance bands. This also provides variety in your workout. Not only can you work out at a park or in your home, you can choose which exercises you want to perform and what muscle groups to focus on. There are two basic types of exercise bands. These include wide rubber strips or tubed bands. Rubber Strips are provided in different widths giving you different levels of resistance. This is the least expensive option. The strips generally do not come with accessories or handles. You wrap the ends around your hand for your workout. They are very lightweight and portable but do not last as long as tubes. Tube Exercise Bands are still lightweight, but will last longer than rubber strips. They also have more options and come with different accessories, giving you more comfort during your workout. As a result they will cost more than rubber strips. The tube bands are most often constructed with either rubber or a latex rubber. The level of resistance a tube exercise band offers is dependent on the size. Typically bands are coded with different colors to indicate its size and resistance level offered. Since there is not an industry standard, it is important to check the bands to ensure you are getting the resistance you need for your work out level. Lightweight bands are best for beginners, those recovering from an injury or seniors who want a low level of resistance. These provide a great low impact workout that is easy on the joints yet build and strengthen the muscles. This will provide about 3 to 6 pounds of resistance weights. Medium bands are great of an overall workout and provide you with 8 to 10 pounds of resistance pressure. The large bands are best for active users who work out regularly. These provide 12 to 16 pounds of resistance. The extra heavy resistance bands are best for the strongest users and provide from 16 to 20 pounds of resistance pressure. The largest bands can provide 30 pounds or more of resistance per band. Combining bands can increase the levels to the desired resistance. It is best to have at least 3 different bands to accommodate different muscle groups. For example a workout with your upper torso may require less resistance than a workout on the lower torso as legs are generally stronger than the arms. Handles: Handles are a common accessory. They can come in plastic or foam depending on your preference. Some handles are detachable and you receive one set of handles and attach it to each band as you use it. Other sets have an affixed handle on each band. Ankle Cuffs: These attach to each ankle and provide stability and resistance when you are using your foot as an anchor. Door Attachment: When you do standing exercises some users prefer to have a door attachment. This allows you to attach the resistance band on the door or wall for completing stand-up exercises. Carrying Case: When you buy a set, there can be a number of pieces to the set. Having a carrying case can help you keep everything together and make carrying the resistance bands much easier. Think about what exercises you will be doing with the resistance bands. Will this be your sole workout or will you be combining it with an existing workout? Consider long term goals. Are you looking to bulk up or to tone your muscles. This will determine what resistance levels you need to be using. Also consider where you are at currently and be sure to buy for that, not just where you hope to end up. As you get stronger you will be able to use higher levels of resistance. When you are first starting out, it is best to use lower levels and work your way to the larger bands. Tubes or strips. The tubes offer greater comfort with regard to handles and attachments. This may be the different between working out or not. The strips are less expensive and take up less room than the tubes because they will lie flat. Foam or plastic handle. Plastic handles can be hard on your hands, while foam handles provide greater comfort. Mostly it is a matter of preference. Attachable handles of fixed handles. Some sets have detachable handles that clip onto the end of each band. This means you have to attach the handle to the tube each time you switch band resistance. Fixed handles are on each band and does not require them to be changed during a workout. This inexpensive workout option is great of those on the go. If you want to work out in your home or office, the bands take up very little room, but provide a top quality work out. They are able to be adapted to those who are just starting out, recovering from an injury, all the way to professional athletes. This wide range of usage makes resistance bands a very popular choice for those looking to stay in shape and remain fit for a lifetime.